On Christmas Day 1814, while many families in Wayne County, Indiana had opened their presents, Stephan Thomas and Hanna Mendenhall were given the best present a parent could ever receive. The birth of their sixth child. Lydia Baldwin, the fifth daughter born to her parents, was married to Thomas Baldwin, the son of Daniel and Christian Baldwin, on September 26, 1833. They were married at the Newgarden in Wayne County, Indiana (Thomas Family). They began their lives together with forty acres of land given to them by Thomas’s father. After traveling for seven days from their former home they came to their new home in Grant County, Indiana near Fairmount. With nothing but the things they brought with them and a log cabin left by the previous owner, Thomas began creating them a home of their own. The crafty man that he was, he created a cupboard, bed steads (the frame of a wooden bed at this time), and some poles for curtains out of some excess wood. Just a few days after they got settled Father Baldwin’s family came up to visit. Daniel Baldwin bought out the former owner of sonic land adjacent to theirs and presented Thomas with enough money to buy forty more acres, more than doubling their former property (Lest We Forget 1-2). Here their first child, a boy named Asa T. Baidwin, was born on March 16, 1835 (Baldwin Family). This child was an adventurer. On one occasion Lydia remembers Asa picked up a big cat one day and came by her when she was washing. She paid no attention to him, although he told her he was going to the bridge to put it on a branch. Asa got down to the river and tried to throw the cat into the water, being of only three or four years of age, the cat grabbed him and pulled the young boy in with him. The cat jumped upon Asa without getting his feet wet. Lydia remembers having to go and pull him out of the water (Lest We Forget 4). Both Thomas and Lydia came from well-educated backgrounds and they expected their son to do the same. Asa received his primary education in the local schools and some from the Old Normal Academy. He then went on to further his education at the Friends Boarding School at Richmond, and institution that later was renamed Earlham College (Blackford County Biographies Page). Thomas and Lydia stayed in this home for nearly a year and a half when they swapped their property with Ben Benbow for his eighty acres near the cemetery in Fairmount (Lest We Forget 3). Here their children Terah, Ann, and Addison Baldwin were all born. Terah was born on the 1st of February 1837, Ann on the 26th of February 1839, and Addison on the 1st of August 1841 (Baldwin Family). When they moved to Grant County both Thomas and Lydia became prominent Friends in the Mississinewa meeting house. Between 1821 and 1843, the Friends in this meetinghouse discussed the issue of slavery. Money was given but nothing was done. The first thoughts of separation were brought up at the Yearly Meeting. With the suggestion and help of an appointed committee these Friends of Deer Creek met in February 1843. They adopted a minute that referred to the secession of the Deer Creek Friends. Finally on February 25, 1843 some of the Friends split from the group. The Mississinewa Monthly Meeting of Friends, those that were anti-slavery Friends, established a Monthly Meeting among themselves. They created the Deer Creek Monthly Meeting of the Religions Society of anti-slavery Friends. These Friends abided by all the rules of the Mississinewa Monthly Meeting, but strongly disagreed with the allowance of slavery. At this meeting Thomas Baldwin was appointed clerk for the day, and at the following meeting, Lydia Baldwin and Giney Ballinger were made permanent clerks of the women’s meetings. 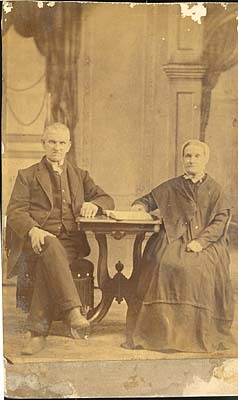 The Baldwins, being two of the members that joined this newly formed group of anti-slavery Friends were known to voice their opinions on the issues of slavery. In one instance the Baldwins were known to object to the use of indigo made by slave labor. They would let their clothes go white when they were clean instead of giving them the desirable blue tint that was reached with the indigo (Whitson 653). The Quaker meetinghouses were designed exactly the same whether they were built out of logs or bricks. The length of the meetinghouse was approximately twice the size of the width. There was a partition placed in the center of the one big room, one room for the men’s meeting and the other for the women’s. The doors were generally located in the center of each room and if you looked at the building from the side two doors would be in view. Many times there were also doors opposite of these on the other side. At the front of the room were the facing seats, or gallery, that the ministers, elders, and overseers sat in, these seats were generally elevated each about eight to twelve inches off ofthe ground. The general congregation sat in pews that were located on the flat ground and faced the gallery. For the first hour of the service the partition would be opened and the women and men would worship together through silence, prayer, and sermons, although separated on different sides of the room. The men’s head of the meeting would be in control during this time, but when the partition was closed, the women’s head of the meeting would conduct the women’s meeting. The particular meeting house that Lydia and Thomas attended, in July 1837, was a log cabin styled as above. In December 1837 the Mississinewa Preparative Meeting decided to build a new house made of frame not logs. In 1913, the meetinghouse was still standing as part of the Snodgrass sanitarium (Ellis 11-14). They stayed in this Fairmount residence for over six years when Thomas swapped the Benbow place to his brother Elias for an eight-acre lot where South Marion is now. (Lest We Forget 5) Here they bore their fifth child, a girl, Mary Baldwin who was born on October 15, 1843 (Baldwin Family). Here in Marion, Thomas and Lydia’s house became one of many stops on the Underground Railroad. The night was never too dark or the danger to great for Thomas to attend to the hunted slaves. With assistance of family and friends, they helped these slaves to find them the freedom in the country that denied them of equal rights and personal existence, even though that is what this country was founded on (Biographical Memoirs 767). There are many other local stops on the Underground Railroad. People like Moses Bradford and Nathan Coggeshall would bring the slaves to the Baldwin home where they would be hidden from the slave hunters until nightfall. There they would be taken, many times by wagon, to the next stop on their journey. Nearly 1500 slaves traveled through Grant County on the Underground Railroad many of which took a stop at the Baldwin home (Underground Railroad Project). They sold this land to move back near Fairmount to Deer Creek (Lest We Forget 6). Here they bore their last two children Daniel Baldwin who was born on June 4, 1826 and Stephan Baldwin who was born August 30, 1854. Daniel also died in this house at the age of six on December 28, 1852. He is buried in the I.O.O.F. cemetery here in Grant County (Baldwin Family). They lived here until they were too old to care for the land and they moved back to Marion to live with Terah. From the sources available they were living with Terah, at 2315 S. Meridian Street, by 1895. Helping his brother care for his parents was Asa the oldest child, he lived at 2311 S. Meridian, just down the road (City Directory 1895). Terah owned and operated his own business, The Baldwin Creamery, located on the corner of 25m and South Meridian Street in Marion (City Directory 1897). By 1897, he sold his business so he could fully care for his ailing parents. They moved to 2516 S. Meridian Street between 1897 and 1899. Living together in the house was Terah, his wife Isabella, their two sons, Lydia and Thomas, and Ora Baldwin (City Directory 1899). On May 21, 1899, from old age Lydia Baldwin died in her son’s home. Just four days after, on May 25, 1899 Thomas Baldwin died here as well (Baldwin Family). In a double funeral at two o’clock in the afternoon at 2516 S. Meridian Street, Terah’s home, the Reverend Haworth, pastor at the First Friends’ church, conducted the ceremony ("Many Attend"). These two Baldwins have become known at this time as one of the oldest settlers of the Grant County area. Their children, mostly Asa, have been recorded at their deaths as one of Grant County’s oldest native sons. All but one of their children continued on with the Quaker faith, the other converting to Christianity with his wife when he married. Thomas and Lydia ended their life with the pride that their family was what they had always hoped—strong members of the Friends Church and supporters of each other in their time of need. Grant County will always know them as some of the first settlers and biggest supporters of the anti-slavery Quaker faith. Baldwin Family, Genealogical File Marion Public Library, Marion, IN. Biographical Memoirs. The Bowen Publishing Company. 1901. "Economics of the 1830s: An Overview." Cormer Prairie Interpreter Resource Manual. 13 December 2001 <http://www.connerprairie.org/historyonline/economy.html>. Ellis, Ellwood O. Early Friends in Grant County, Indiana. Ed. Willard Heiss. 1825- 1913. Lest We Forget: Reminiscences of the Pioneers of Grant County, Indiana. History Department of Marion High School. Marion: Printing Department of Marion High School under the direction of B.H. Pemod. "Many Attend." Marion Daily Leader. 23 May 1899; 3. Marion City Directory. Marion: Polk, 1895. Marion City Directory. Marion: Polk, 1897. Marion City Directory. Marion: Polk, 1899. Thomas Family. Genealogical File Marion Public Library, Family Group Number 7716, Marion, IN. Underground Railroad Project. Northstar Productions. 1996: 13 December 2001 http://www.ugrr.org//names/map-in.htm. Whitson, Rolland Lewis. Centennial History of Grant Counry Indiana. 2v. Chicago, Lewis, 1914. This article was written by Jessica Strange for Mr. Lakes's English 11 and Mr. Munn's AP US History classes at Marion High School. It was submitted on January 10, 2002. This page was last modified on 2 May 2011, at 19:58.